We’ve spent hours comparing the different models on offer from 10 of the leading UK merchants. These merchants make up 95% of the market so you can be sure the sheds that have made it onto our list truly are the best available. So which Shiplap sheds made it onto our list? At the number one spot we have the outstanding 14’x8’ Mercia Ultimate Shed. Smaller models are available so there is something to suit all size gardens. This particular model however is great for those with big storage needs. It is the most expensive shed on the list but that price is definitely worthwhile. Built from 16mm Shiplap, this is one of the most robust, long-lasting shiplap sheds on the market. Most Shiplap sheds come with 12mm cladding, so the extra thickness of this one gives you more strength, stability and even warmth in the colder months. The windows and doors provided are also factory fitted which speeds up assembly time. For security the double doors have been fitted with a RIM lock. 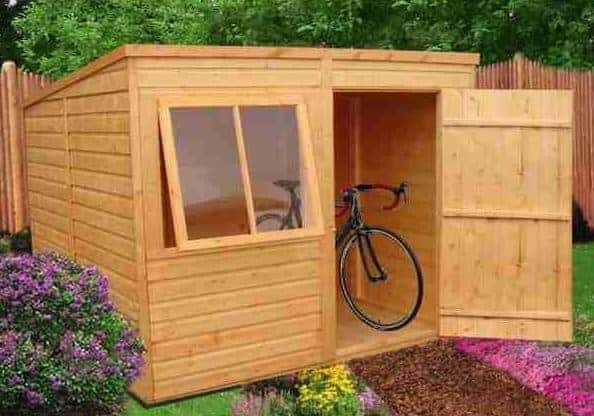 Absolutely everything has been thought of in this sheds design, earning it the ‘Ultimate shed’ award. Another full Shiplap tongue and groove model, the 6’x8’ Apex Garden Shed offers a very stylish, charismatic design. It looks more like a playhouse than a standard storage shed. Front facing windows allow more light into the shed than side-facing models whilst also providing a homely design. It is the quality of this shed that we like the most however. The tongue and groove floor means you can store heavy machinery and tools and the extra thick rounded and planed framing provides a very sturdy structure. Security is another priority with this model, with a good quality RIM lock added for protection. Its fantastic quality design earns it the number two spot on our Shiplap Sheds list. This Treetops Traditional Standard Pent Shed is available in a wide range of sizes but the 8’x6’ model is by far the most popular. 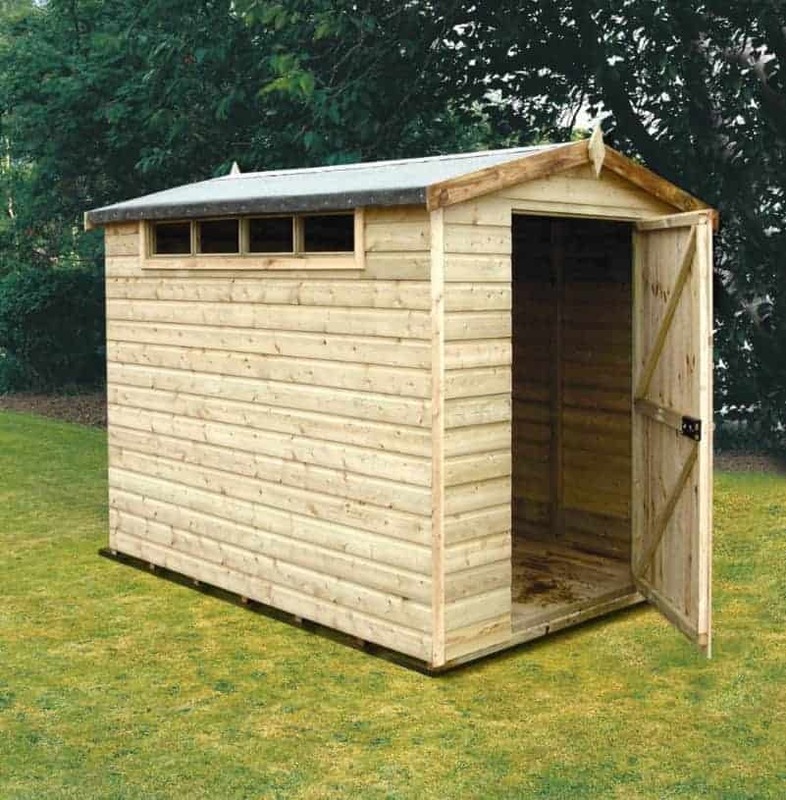 We’ve reviewed hundreds of different sheds, but we’ve struggled to find one to match the quality of this model. It isn’t just the quality that has awarded this shed a top 3 spot on the list; it also comes with a range of customisation options. The door can be placed in five different places and the fixed windows can be upgraded to opening varieties or you can get rid of them completely. No other Shiplap sheds give you the same level of customisation as this one. It is also one of the very few sheds to be constructed from DEAL Redwood. This gives it a unique style with a superior quality finish. We also love that it has a full Shiplap tongue and groove build and a high security key operated lock. If you’re looking for a shed that’s really going to stand out, the 8’x8’ Double Door Premier Shiplap Tongue and Groove Dutch Barn Shed is a great option. The unique barn design creates a focal feature in the garden. It also provides a substantial amount of interior space. There are a few barn style sheds out there, but this one comes with a unique opening window, making it more comfortable to use in the summer months. The large double doors open out to allow plenty of access space. This makes it suitable for storing larger, bulkier equipment such as ride-on lawnmowers and machinery. Its affordable price combined with its excellent quality design make it worthy of a spot on our top 20 Shiplap Sheds list. 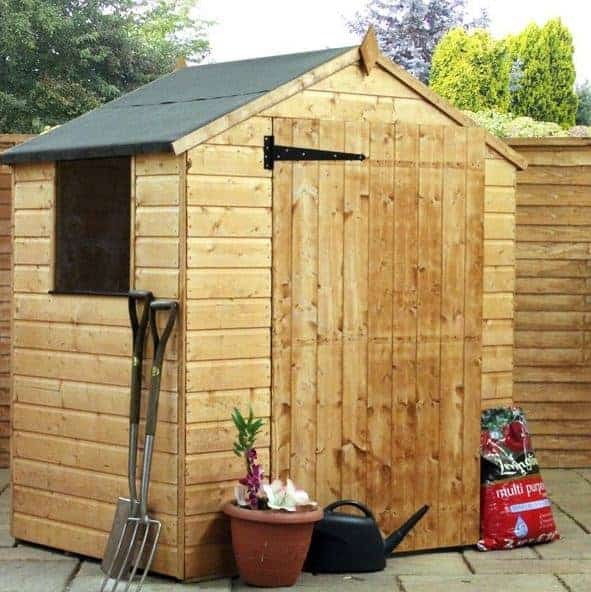 This outstanding 8’x6’ Pent Shiplap Wooden Shed from B&Q is great for storing gardening essentials. Unlike most pent sheds, this one has more of a reverse pent design. Allowing you to install it against other buildings, it offers a great space-saving design without compromising the level of interior space provided. So why is it part of our top 20 Shiplap sheds list? 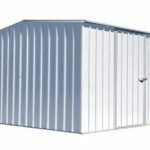 Aside from its space saving benefits, this rigid looking shed also benefits from very high security. There are 4 small fixed windows added to the top of the shed, allowing light into the building whilst preventing anybody from peering inside. There is also a key operated lock added to complete its secure design. Thanks to its European softwood construction the shed also has a brighter, more attractive style than many of its competitors. Not often do we come across a shed that really stands out in terms of design. The Windsor Curved Roof Aero Shed is by far the most uniquely designed shed we’ve come across. There really is no other shed like it. 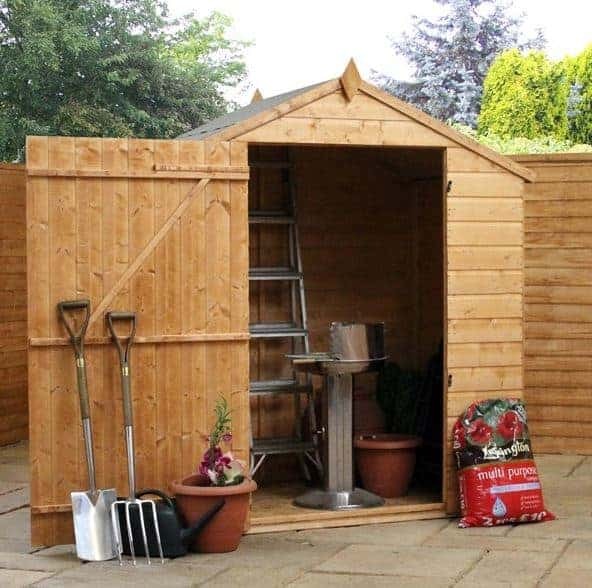 Measuring 4’x6’, this shed is ideal for more compact gardens, though it does offer a substantial amount of interior height for storing taller tools. The curved roof is this sheds stand-out feature. Offering a great overhang at the front to protect against water damage as well as giving it a modern, elegant and unusual appearance. However, it also benefits from unusually tall windows at either side. These fixed styrene glazed windows add a superb level of light into the shed and are totally shatterproof for safety. 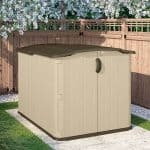 Offering quick and easy assembly, this shed is great for those looking for something a little different from the norm. Built with heavy storage in mind, the 8’x6’ Rowlinson Premier Shiplap Shed is a great, medium sized storage shed. The opening window and Shiplap tongue and groove floor are just two of the main benefits included with this model. We are impressed by the quality that has been given to both the interior and the exterior of the shed. Shiplap sheds in this price bracket and of this size don’t usually come with such high quality features. Though it’s a subtle difference, the fact the two windows are distanced further apart than the majority you’ll come across also adds to the shed’s appeal. We feel it gives the building more of a homely look. Compared to other competitor sheds, this one also benefits from a honey brown finish; helping it to really stand out in the style stakes. A tall apex design means you can store practically anything in here. 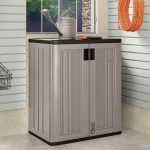 This truly is a well-priced, great quality storage shed that is guaranteed to last at least 10 years with annual treatments. We love this 6’x6’ Shiplap Tongue and Groove Apex Garden Shed from Waltons. It is one of the most affordable Shiplap shed on the list. If you’re looking for value for money, this is definitely the shed for you. There are a few stand out features for us that make this one of the best Shiplap sheds available. One of them is the two opening styrene glazed windows. Enabling you to allow a lot of air into the building, they really help eliminate potential problems with mould. The double doors are another excellent feature. 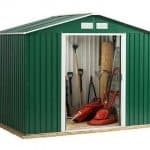 Most sheds of this size are equipped with a single door so this one does allow you to transport your storage quicker and easier in comparison. A pre-fitted key operated lock also provides great security. Out of all of the Shiplap sheds we’ve reviewed, this one definitely stands out as one of the best. 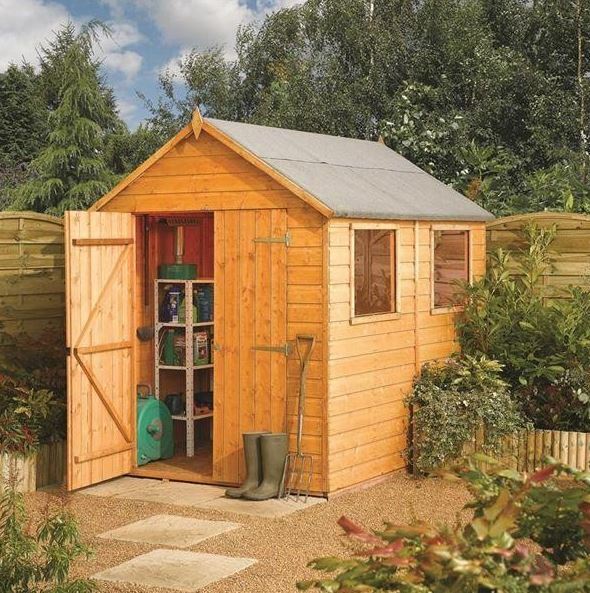 This 7×7 Offset Apex Garden Shed is both aesthetically pleasing and practical. It features on the list for its unique design, affordability and premium Shiplap construction. 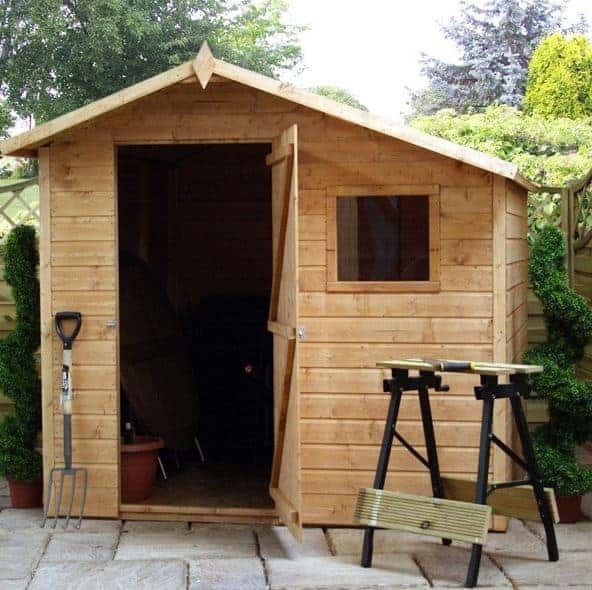 Adding a cosy, welcoming feel to the garden, this great shed is quick and simple to build and is capable of withstanding anything the UK weather has to throw at it. A 10 year anti rot guarantee is included, giving you peace of mind that it is really built to last. 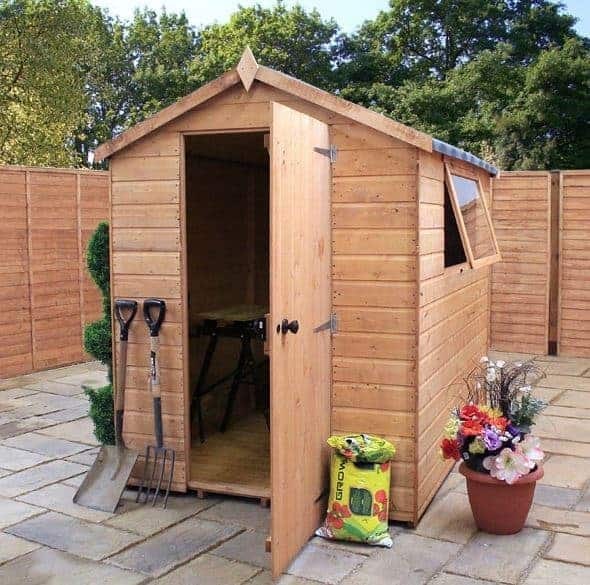 The shed is just smaller than average but it still offers an excellent, tall and spacious area to store anything from tools and gardening equipment to patio furniture. We also like its wide single door design as it enables you to transfer even larger items in and out of the shed with ease. It is one of the lowest priced Shiplap sheds available. Next up on the list is this incredible medium size shed constructed with premium materials. What we really like about this model is its extremely competitive price. It is one of the best priced Shiplap sheds out there and what you get for your money is really impressive. Take the opening side window for example. Made from 2.5mm shatterproof styrene, the fact you are able to open the window ensures you get a great amount of ventilation, reducing the risk of mould and fungus. One thing you’ll find when looking for Shiplap sheds is that they often feature an OSB interior. This model however benefits from a full Shiplap tongue and groove construction, meaning this shed is well suited for heavy storage. It also comes with a RIM lock for excellent security. It is one of the best all-round Shiplap sheds currently available on the market. This compact, cute little Ultimate Shiplap shed is the smallest on the list. 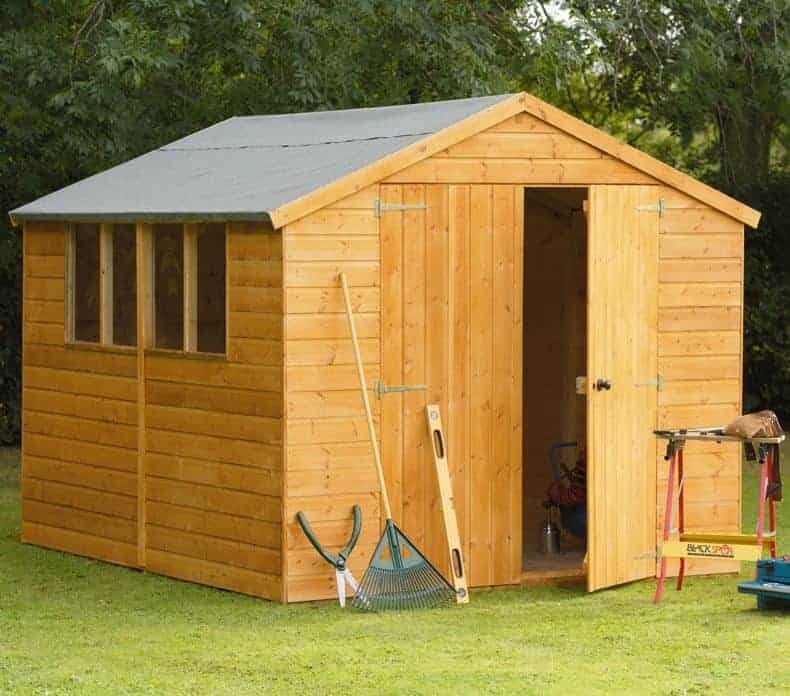 Great for those who don’t have a lot of storage requirements and with limited space available, this high quality robust shed is a must. So what sets it apart for us? Well, the manufacturers have given it a pressure treatment to ensure it lasts up to 15 years against rot. The pressure treatment also means you don’t have to give it annual maintenance. This equals fantastic cost savings and also highlights just how durable this little shed is. You should find it really quick and simple to install and thanks to its tall apex roof, you’ll be able to store taller tools and equipment with ease. This truly is one of the most robust, high quality compact Shiplap sheds we’ve come across. 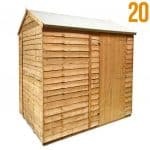 One of the larger models on our top 20 Shiplap sheds list, this model is technically advertised as a workshop. However, the reason we’ve included it in the list is because the only thing that really sets it apart as a workshop is its size. So it makes an equally great storage shed. We love that the building is secured with a key operated lock. This isn’t something you come across very often and it enables you to keep your storage completely secure. You’ll also see the build of the shed is incredibly solid. This isn’t just reflected on the outside, it is also highlighted by the extremely thick 45mm x 28mm framing inside the shed. So if you’re searching for a large, high quality Shiplap shed that won’t break the bank, this one comes highly recommended. This 6’5” x 4” Shire Shiplap DD Shed is one of the most rigid looking sheds featured on the list. You can tell just by looking at it that the manufacturer has really built this shed to last. As well as offering a solid exterior, the interior of the shed benefits from thicker than average 34mm x 34mm framing. This means you getting an exceptional quality, stable storage space at a great, affordable cost. We also love the opening window fitted onto the side of the shed. It’s unusual for a shed at such a low cost to come with an opening glass window. It enables you to get a good level of air circulating through the building, preventing issues with mould and rot. So if you’re looking for a good, solid, affordable Shiplap shed that is going to last for many years to come, this is a great model to consider. Convenience and privacy are the main reasons this great Shiplap shed has made it onto the list. By far the most impressive feature of this model is the width of the door. It takes up almost the entire front of the building, ensuring you have plenty of space to get in and out with even the bulkiest of equipment. The fact it has no windows will also appeal to those looking for a more private shed. The low price is also a leading factor in our decision to include it on our top 20 Shiplap sheds list. For a budget shed you are benefitting from exceptional quality here. An added bonus is the fact the door has been factory fitted, ensuring self-assembly is both quick and simple. Its compact size makes it great for smaller gardens too. Two things stand out to us with this 4×6 Shiplap OSB Apex Garden Shed. The first is the extra-wide single door. Due to the compact size of the shed, the door offers outstanding access into the building. It also acts as a great focal point; really dominating the shed’s design. Like the window, it has also been factory fitted which we are particularly impressed with. This means it is much easier to install and saves a lot of potential stress when you’re attempting to put it together. If you’re looking for a shed that offers convenient, quick and easy access then this is one of the best Shiplap sheds you’ll come across. The second thing that stands out for us is the price. 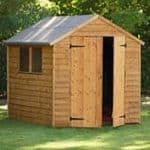 Obviously it is slightly smaller than the average garden shed, but even with that in mind, it still comes at an impressively low cost. 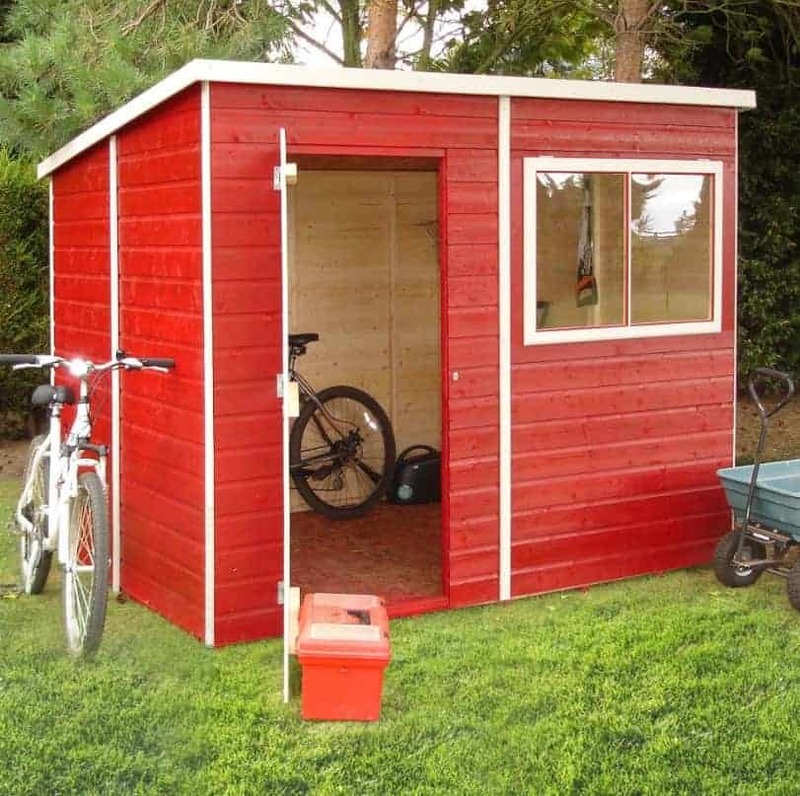 This is an excellent budget shed which offers plenty of value for money. This 8×6 Apex Shiplap Wooden Shed caught our eye because of its excellent security benefits. Whilst a lot of Shiplap sheds give you the opportunity to make them secure, not many actually come with the security already taken care of. So what security features does this one offer that many others don’t? Well it has both a lock and key door and security windows. The integrated key operated lock isn’t easy to remove like a pad bolt or hasp and staple. It also ensures the only people who can gain access to the shed are those with the key. The security windows are also unique in the fact they are placed high up on the side of the shed. They allow light to filter into the shed, without allowing anybody to peer through them. So if security is important to you, this is the Shiplap shed to opt for. Another space saving pent shed, the 8’x6’ Shire Pent Shiplap Wooden Shed has made it onto the list for both its practical and aesthetic benefits. As well as offering more flexibility in terms of where it can be installed compared to an apex shed, this model also comes with an opening front glass window. This enables you to properly ventilate the building, helping to reduce potential rot and mould problems. The use of glass for the window is also unique as most tend to come with styrene glazing. The glass is slightly thicker so you’ll benefit from more insulation and reduced noise levels, as well as added security. It also offers a great, attractive design and comes with a fairly wide spacious single door. Extra thick framing ensures the shed is fully supported and boosts its durability. All in all this is a great all-round performer that is well deserving of its spot on our top 20 Shiplap sheds list. 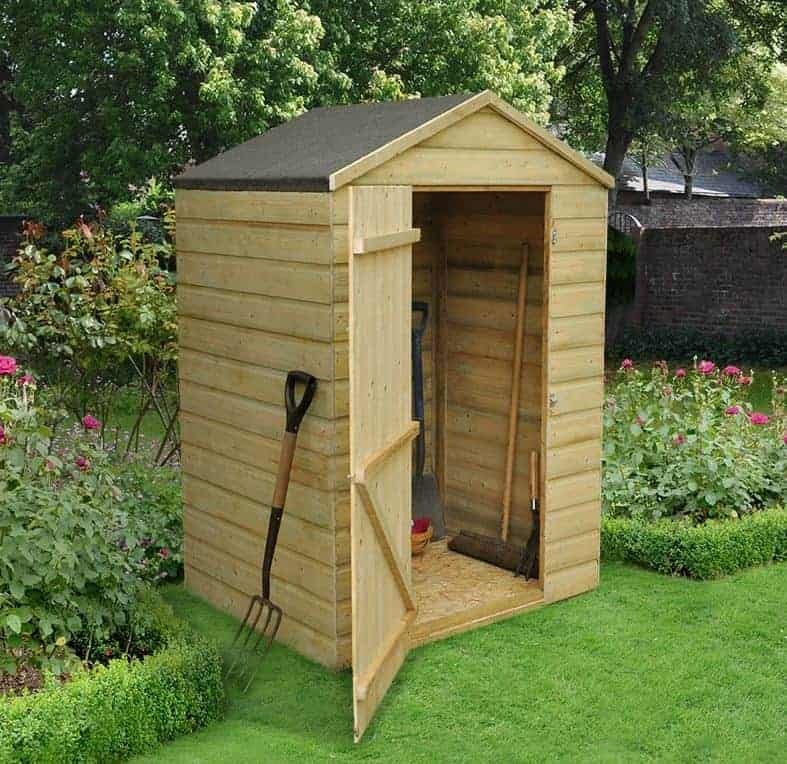 The slightly smaller than average Waltons Groundsman 7’x5’ Shiplap Tongue and Groove Apex Garden Shed has made it onto our top 20 Shiplap sheds list for a few reasons. Firstly it is a great choice for those who don’t have a lot of space in their garden. 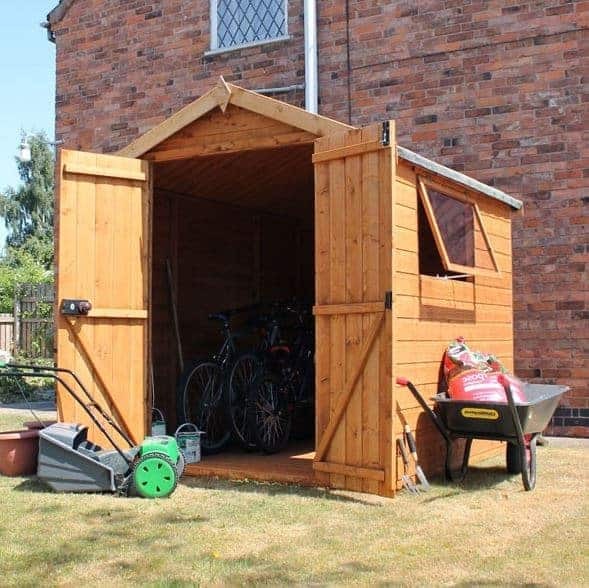 Whilst it offers a more compact design than the majority of sheds out there, it still gives you plenty of internal space to store gardening tools and equipment. The opening styrene glazed window fitted on the side of the shed is another advantage. You’ll find most sheds offer fixed windows, so the fact you can open the one on this model is a unique benefit. Then there’s the great security offered from the built in Rim lock. All in all this is an incredible, affordable Shiplap shed which really does outshine many of its competitors. If you’re looking for great value, the Windsor double door 8’x6’ Shiplap Garden Shed is definitely the one to go for. After researching hundreds of different models, this is by far the best value Shiplap shed we’ve come across. Backed by a 10 year anti-rot guarantee, this durable, solid shed benefits from styrene glazed windows, a free basecoat treatment and plenty of interior space which all add to its excellent value for money. Perhaps the best thing we like about this shed is its extra-tall height. This makes it one of the best Shiplap sheds to go for if you have a lot of taller equipment and tools. It isn’t often you come across a Shiplap shed which is sold with an installation service included. 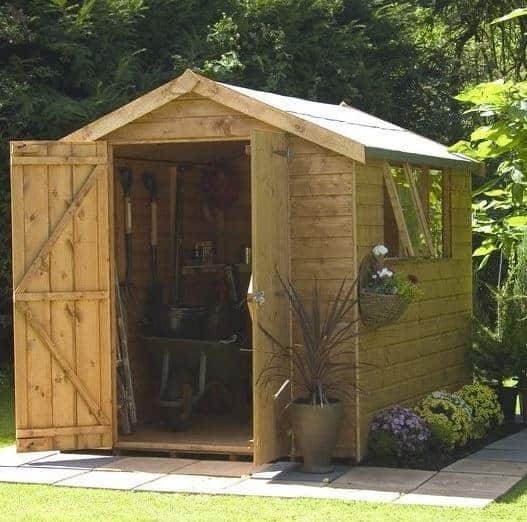 That’s one of the main reasons why we’ve added this great shed from B&Q onto our top 20 list. If you’re not a fan of DIY then this is definitely a good model to consider. 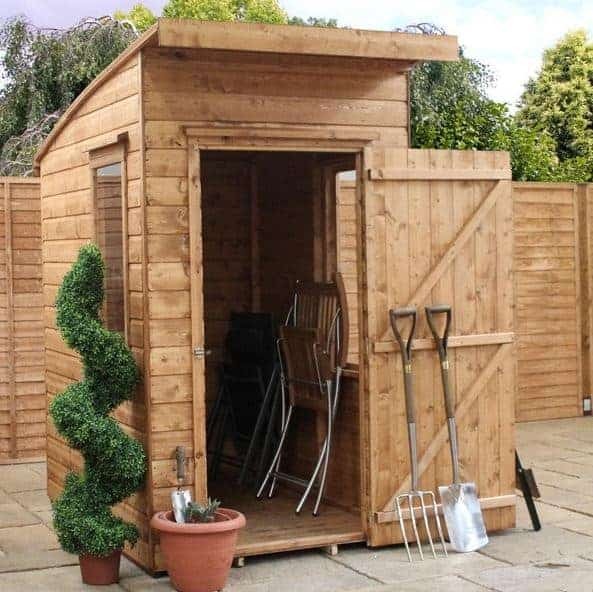 It is also one of the most popular size Shiplap sheds on the market; offering more than enough space to hold your gardening essentials. It isn’t just the non-assembly benefits that have helped put this shed on the list however. It also benefits from a unique pent design. 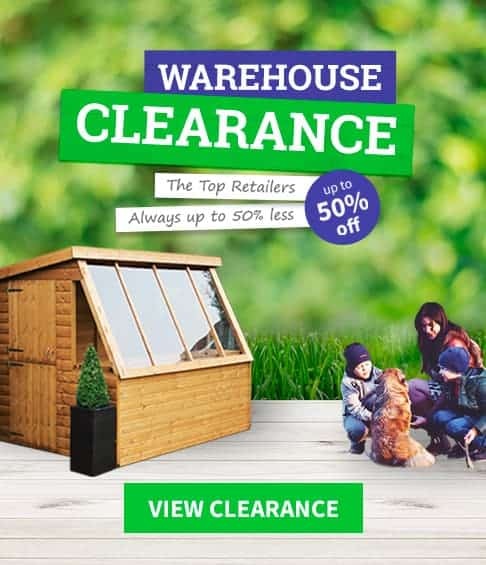 This means it is great for gardens which have height restrictions that would prevent you from installing a taller apex shed for example. The shed is built from 12mm Shiplap and what we really like is the attention provided to the smaller details. A hasp and staple has been fitted to the door for example, providing a great opportunity to add a padlock to keep your storage secure. This type of lock is stronger than the typical pad bolt or turn button catch typically found on most sheds. So compared to most standard Shiplap sheds out there, this one definitely stands out.